Thanks for all the suggestions on my White Rabbit Disney bounding, guys! I completely agree my outfit needed a teal/light blue scarf, but it was HOT on Saturday - 86, I think - so just my red cardigan had me overheating. Next time, though! Ticket to Ride was easy to learn and fun to play - a good gateway game into the tabletop genre. We played Ticket to Ride in the UK and then Cards Against Humanity in the US - which I will disavow all knowledge of if asked - but since we were tucked away in both spots, we were only spotted by one reader. Sorry I missed the rest of you guys! Aaaaand now I have to get back to my "real" "job." Boo. Hope you guys had a good weekend! Heh. That shirt kinda reminds me of Bina from the comic Monster Pulse. She's got one like that. We've been dying to get Ticket to Ride since seeing it on TableTop & finally bought it Saturday and I love it more than I thought I would. I want to play it all the time. Lol. Looks like you had a blast. Cards Against Humanity can be hilarious, but somewhat x-rated. Those allergy attacks can be purely awful. I've found it very helpful to take my meds at bedtime, so they're working full-force in the morning when pollen is the worst. I also take apple cider vinegar with local honey. Feel better, John. Oh Cards Against Humanity, guilty pleasure party game. Love the cosplay! Instead of a blue scarf, what about a blue ribbon threaded in the necklace chain? Subtle but the spot of color for a collar. And cooler. Your DB needs no improvement. My two best friends are taking me to Disneyland in a few weeks for my birthday (I haven't been since 1992! ), and thanks to you turning me on to this whole "bounding" thang, I shall be serving Mary Poppins Realness! Now I just need to decide if it'll be Regular Mary or Jolly Holiday Mary. I need to decide soon, spit-spot and no dawdling! I wish I could go on my actual birthday, which happens to also be the great big Goth Day at Disneyland, since the crowd will be full of Freakyfreaks (my People! Embrace me in your clove cigarette scented love!) instead of scary Mundanes, but it's also the same day as the big San Diego Pug Rescue fundraising party (the only thing cuter than a Pug is a Pug in COSTUME!) and adoption drive, and I have my fingers crossed that I will come home that day with a new smooshy-faced friend. This house is too damn quiet without all the snorting, snoring, and shnurfling; my Vulcan tries, but it ain't the same. But of course! 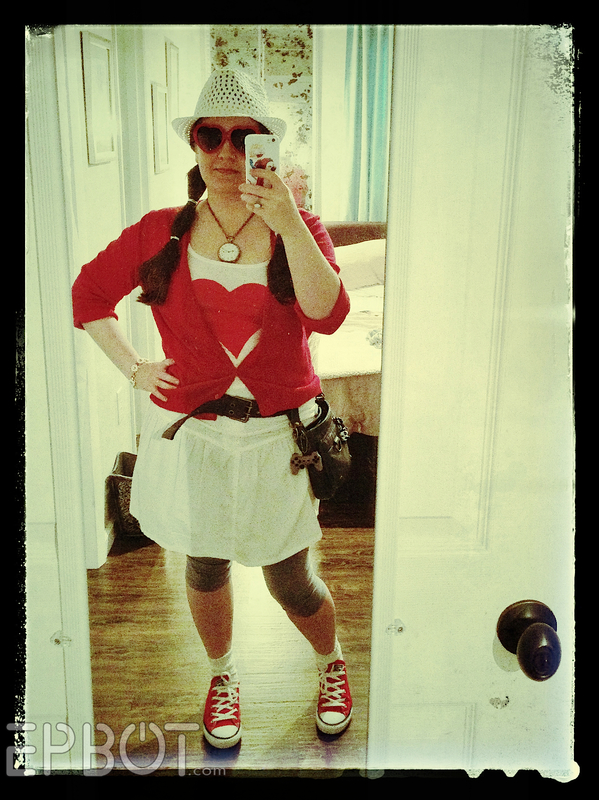 I've decided it'll be best to go with Regular Mary, although I've been wanting to do Jolly Holiday Mary since I was a kid, JUST for the hat and the red cincher! But I already have a lot of elements in my closet to do a passable version of she who is Practically Perfect In Every Way. I'd already planned on using my black parasol that day (the Yellow Face, it burns us, Precious! ), and now I have twice the excuse. I see your Woot, and raise you a WOO HOO! technically, because you blogged about it, this IS your real job. Not so much with allergies. Should try acupuncture. It has done wonders for mine. You guys look great! 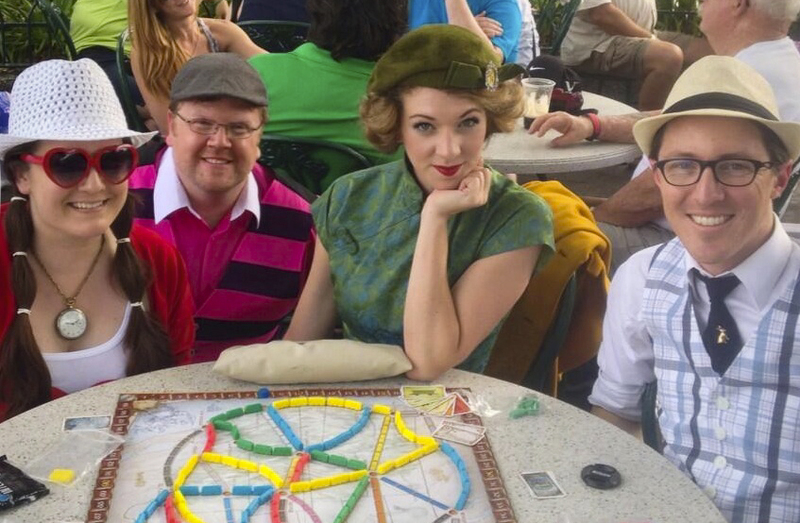 Did you get weird looks for playing board games at Disney? I don't think I've seen anyone bring their own games to Disney, but I'm usually too busy running from ride to ride to notice. Not that we noticed, no! Some people at nearby tables wanted to know what we were playing, but they were really cool about asking. That's cool! Man, I wish I lived closer to the parks so I had time to just hang out and soak in the atmosphere. I have terrible allergies. I have found that benadryl at night and zyrtec in the morning with 12-hour extended release sudafed (from behind the pharmacy counter, aka: the good stuff) both at night and in the morning keep things at bay. I used to get horrible hangovers from benadryl until I learned about the dye-free stuff. It even comes in generic. Since I stopped taking the unnatural pink ones, I wake up fresh as a daisy as long as I have at least 6 hours of sleep after taking the benadryl. Antihistamines aren't enough. You have to take a decongestant as well to get the crap out that the antihistamines don't stop. My doctor gives me a prescription for the sudafed so I'm not subject to the monthly legal limits. I get 60 per month that way. Insurance doesn't cover it, but at least I'm not begging my friends to come to the pharmacy with their ids to buy me drugs anymore when I max out the limits during allergy times. Good luck to John. I haven't missed any work this year since I figured out the combination late last year! By this time last year, I had already missed 5 days of work due to allergies. I just realized that I've been "bounding" in my own way for a couple of years now, and didn't know it had a name! Except I'm not dressing as a specific character, but instead subtly working Steampunk into my everyday clothes, with the goal of eventually making a natural and livable Real World Steampunk Wardrobe. : ) I've been blogging about it, at Minnie Zephie's Steampunk Treasure Trunk, and would love anyone who likes the idea of joining me in Steampunk "bounding" to come by! I would also LOVE people who love Steampunk to offer suggestions to me about ways to improve looks--so often I get near-misses, and sometimes it's hard to pinpoint exactly what went wrong, or what I could do differently. And I would also LOVE to hear/see what little bits of Steampunkery others are working into their own daily wardrobes. Please do come by, anyone who wants to visit, and bound with me! Here's a sample post, which might give you Steampunk-fashionistas a chuckle! Girl, I'm right there with you, but in a lot more black; I've been dressing this way since it was still called being a Neo-Victorian Goth (do the kids still call it that these days?)! Any excuse to get in a petticoat, I say! We were standing right next to you guys by the Rose & Crown, and didn't know it until we saw these pics..... LOL!! I love to play Ticket to Ride. Small World is also another fun board game to play. My daughter loves to play Small World with us too! My sis and bro in law are big gamers, table top and video. They introduce us to all sorts, ticket to ride, small world, glory to Rome and most recently - pandemic. All great games, pandemics very good as its cooperative rather than against each other. But weirdest time was them introducing us to cards against humanity and my Mum joined in. Christmas Day involved rather a lot of rude and obscure comments, whilst hoping the kids stayed in bed. Great fun though. Ps - cute outfit. Really want to do Disney but just tooooo expensive from the uk. So I go vicariously through your blog. I wonder if you could play Ticket to Ride via Skype? Probably not. But I'd be happy to try! Alos, just found out that my work party is Wizard of Oz theme. I started planning my Bound for it on the drive home! Has John tried essential oils for his allergies?